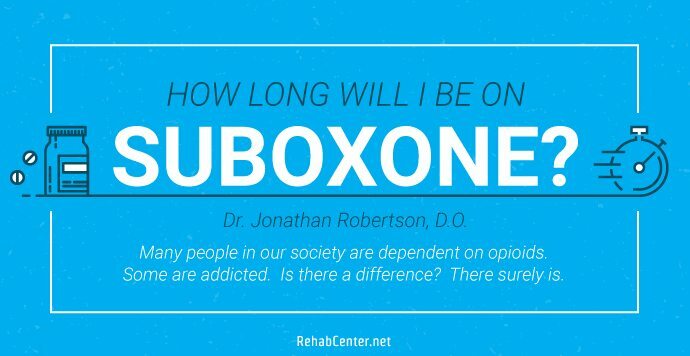 How Long Will I Be On Suboxone? Many people in our society are dependent on opioids. Some are addicted. Is there a difference? There surely is. Dependency is a physical characteristic. It begins and ends with the question of whether or not you will experience withdrawal if you quit a drug. In my practice area those drugs are opioids. Addiction is a far different animal. It often begins when a person starts taking more than is needed to treat the physical pain. It becomes much more complicated when a person begins to take an opioid for emotional management, and it becomes a demon once a person engages in activities such as skipping work to use, continuing to use and refusing to stop even after a person’s body starts giving them not-so-subtle signs of serious harm as well as finding that other significant areas of life simply fail to be as important as the opioid abuse itself. Even though at a certain point a person has the experience of not attaining the high they previously did and chases opioids most days to simply stave off withdrawal, it is the psychological and social aspects of the abuse that define it as abuse/addiction not simply the physical dependency. One way to treat opioid abuse disorder is to get a person under the care of a physician, get their withdrawal stabilized, introduce a blocking agent and get them into counseling. This is what is known as Medication Assisted Treatment (MAT), and it is has been a miracle for millions of people suffering from opioid use disorders. “It depends.” –It really is that simple and yet that complicated. When a patient is seeing me for the first time, after a thorough assessment we have a conversation about the expected length of the treatment. I tell my patients that this therapy is for the rest of their life. Yes, I said that it is expected that this will be for the rest of their lifetime. As a physician, I follow the American Society of Addiction Medicine (ASAM) treatment standards which state unequivocally that MAT treatment is for life. Practices and standards do vary across the field. Medicaid guidelines require that physicians attempt to wean the patient off in 12 months. This is unrealistic for many patients, though we always try to wean a patient down to the smallest dose possible to keep them out of withdrawal throughout the day, but the fact remains that some people will need this treatment for life. Now, that is not an absolute. It is not written in stone, and for many patients this is not going to be the final therapeutic outcome, but for some this is a very realistic way to look at this therapy. After all, this is about a life without chasing the demon of opioid addiction and physical dependency, so it is a reasonable question to ask “How long might a person need to be supported in this recovery process”? How long might a person need to take a stabilizing drug along with a blocker? For some, this might mean ongoing maintenance for a very long time. Some patients manage to wean-down off the therapy in as little as one year. Some are on it for several years before they are able to begin to transition off the drug therapy. Still others are on a maintenance dose indefinitely. Length of this therapy depends on a lot of factors. And by “a lot of factors”, I mean that each person has their own unique set of circumstances, and this therapy is a “whole person” approach. Given this, it is reasonable that some people’s circumstances and personal reasons for using might take longer than other’s to mend and that in some cases it is reasonable to expect that the person will take part in this protocol for the rest of their lives. There is no simple way to address the myriad of factors that account for how long a person is on Medication Assisted Treatment, but there are some that show up more than others. One of the largest factors that affect the length of a person’s time on Medication Assisted Treatment is their overall ability or willingness to follow the requirements of the program. This medication is not PRN (as needed). It is a therapy that is designed to eliminate physical withdrawal and cravings, and this therapy is designed to be taken at the minimum dose necessary to accomplish this. Given this, taking more medication than is prescribed can lead to failure of the treatment and can interrupt the process and cause a person’s therapy to take longer to accomplish its goals. In the worst case, this leads to dismissal from the program itself. Lets’ be honest for a moment and agree on one simple fact: a great deal of opioid addiction results from an emotional desire to take opioids “when I need it” to deal with what life throws at us. Medication Assisted Treatment is designed to break this cycle by using a drug that can be taken as little as once per day. In the beginning, some patients opt to break up their dosing into twice a day or even three times per day, but the drug is designed to last 22-24 hours eliminating the need for multiple doses per day. Breaking the cycle of taking an opioid when a person feels that they “need” it is part of the magic of Medication Assisted Treatment with Buprenorphine, and after a while in the program many patients choose to start taking the medication once per day. This allows them to simply do it and forget about it, thereby eliminating the anticipation of taking an opioid later in the day or multiple times per day. There is no substitute for adhering to the prescription and learning to avoid taking extra doses when you are “stressed out” or going through “hard times”. Breaking this cycle will help shorten the time in the program by retraining your thinking, emotional reactions and behaviors. Medication Assisted Treatment is a combination of the drug therapy and formal substance abuse counseling. One without the other is not as effective as the two in combination, and it is for this reason that the federal government has mandated that those taking part in MAT with Buprenorphine/Naloxone therapy must also be involved with substance abuse counseling. Counseling is not an option for participation or success in the program. While every practitioner has slightly varied requirements for this therapy, I tell my patients that they need to be doing regular, individual sessions with their therapist. Outpatient group encounters can be added to this, but the group encounters are not enough by themselves. The drug therapy is simply not enough. Counseling is where the rubber meets the road so to speak. Research shows that those that have engaged in heroin use or intravenous drug use such as “shooting” heroin or other prescription opioids, have a more difficult time with maintaining long term sobriety. It is not surprising then that studies have shown that those with this type of history of use require more time in an MAT program than those who have never used heroin or this delivery method. Those with co-occurring mental health diagnoses such as severe and uncontrolled anxiety/panic attacks, depression, schizophrenia or other significant mental health challenges may benefit from a long-term even life-long approach to treatment. Counseling and psychiatric care can assist with shortening the duration, but for mental health disorders that are resistant to psychiatric care, MAT may fill a vital role in the long-term recovery process and can help reduce or eliminate the harms associated with self-medication strategies that led to addiction. While there are a few larger considerations for how long a person is on MAT, the duration of the protocol is a part of a “whole person” approach that recognizes that there are a lot of factors that come into play when deciding whether to start a wean-down or tapering of the drug therapy. I like to remind patients that the plan is always to have them on the lowest dose possible regardless of the length of the treatment. For some people this is a single tablet or strip per day. For others this is a half or even a quarter. While many patients do not stabilize on this small a dose initially, they can be tapered down to these doses without experiencing withdrawal if they work closely with their doctor. Once these areas are stabilized over a long period, a person can begin the conversation with their physician about reducing or ending the use of MAT. Without stabilization in these critical areas, it is recommended that the therapy continue. This means that in some cases the therapy goes on indefinitely.